Tunisia's Leader: Activist, Exile And Now President Tunisia's president is a former doctor and human-rights activist who was jailed under the previous regime. In an interview with NPR Morning Edition host Steve Inskeep, he says expectations are high and jobs are scarce following last year's Arab Spring revolution. Moncef Marzouki, the president of Tunisia, photographed in the presidential palace. 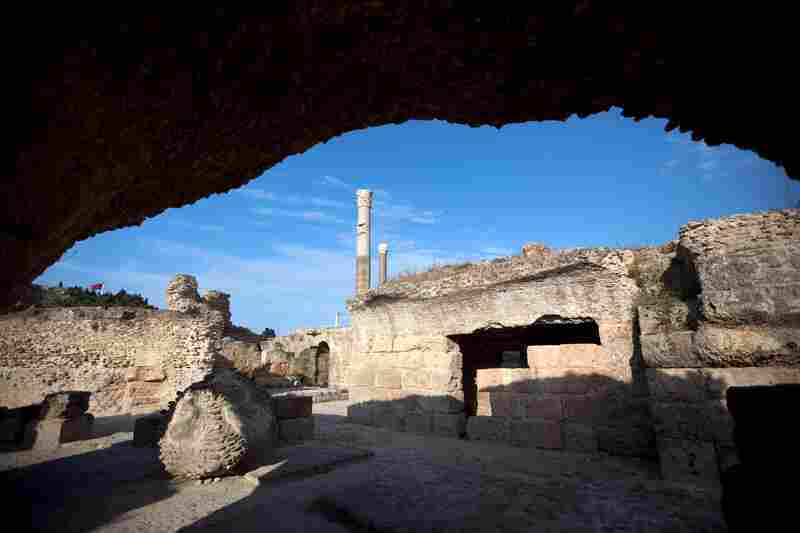 The ruins of the Roman baths in Carthage, just outside the Tunisian capital Tunis. Inside the presidential palace, now home to Moncef Marzouki, who became president last December. 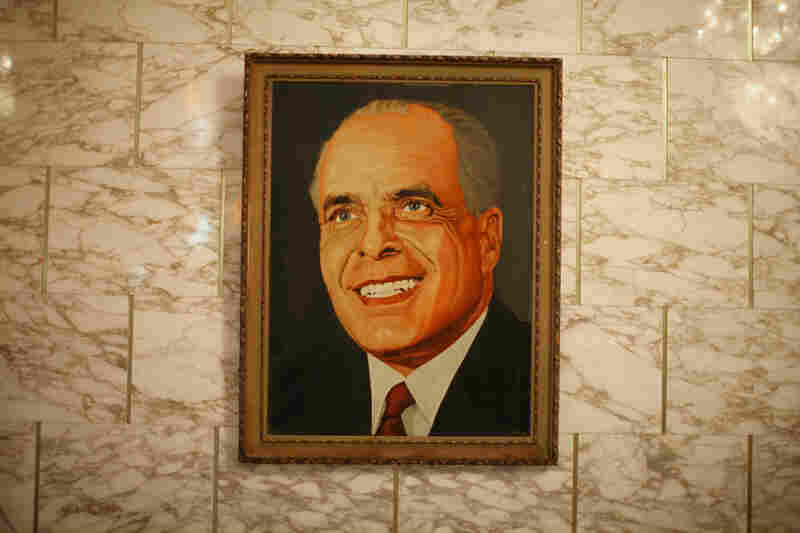 A portrait of Habib Bourguiba, the founder of modern Tunisia and its first president, hangs in the presidential palace. 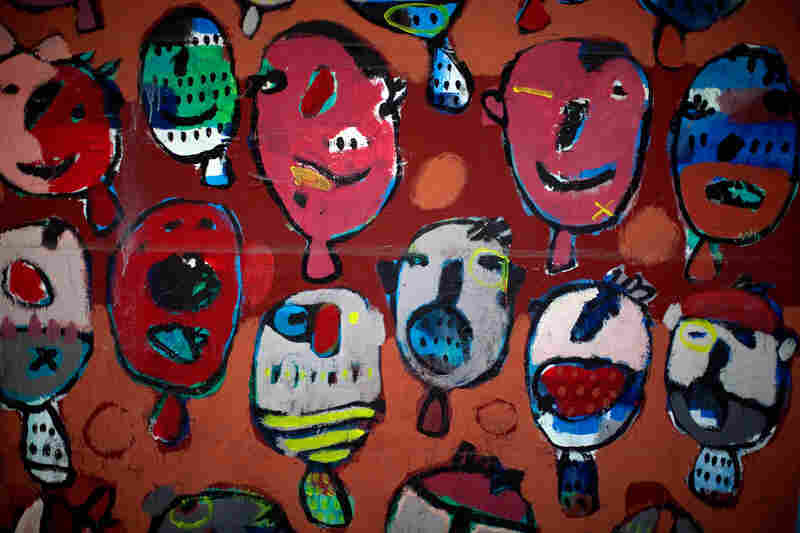 Colorful graffiti in on an underpass in Tunis that appeared after the Tunisian revolution in January 2011. NPR Morning Edition host Steve Inskeep is taking a Revolutionary Road Trip across North Africa to see how the countries that staged revolutions last year are remaking themselves as they write new social rules, rebuild their economies and establish new political systems. Steve and his team are traveling some 2,000 miles from Tunisia's ancient city of Carthage, across the deserts of Libya and on to Egypt's megacity of Cairo. In Tunisia, he sat down with the country's new president, Moncef Marzouki. Decades ago, the founder of modern Tunisia built a palace for himself. Habib Bourguiba managed to peacefully win his country's independence from France in 1956, and then proceeded to monopolize political power for three decades, a fact represented by his palace. The palace is a complex of buildings on a spectacular site, facing the Mediterranean Sea and beside the ruins of ancient Carthage. Visitors arrive through iron gates into a courtyard vast enough to bring London's Buckingham Palace to mind. 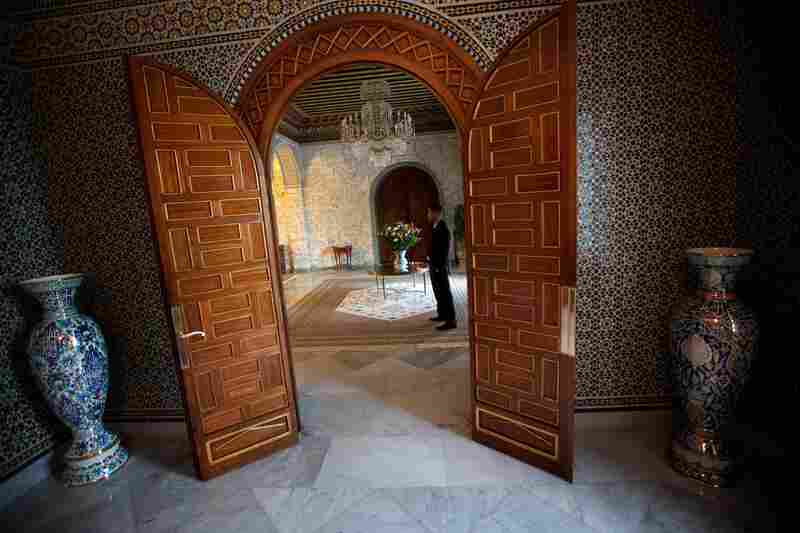 From there they enter through a hall decorated with grand columns, and wait for the president in a special room with green stuffed furniture and a Romanesque mosaic on the wall. When you have been under dictatorship for over five decades your main problem is to prevent a new dictatorship. So now we are discussing about how to share power between the prime minister and the president so that no one can become dictator. At some point, Bourguiba had his portrait painted. Unlike so many leaders who have had themselves portrayed as solemnly gazing up and into the distance as if seeing the future, Bourguiba is smiling brilliantly. And he's also gazing up and into the distance as if seeing the future. In 1987, one of Bourguiba's aides deposed him in a bloodless coup. Zine El Abidine Ben Ali took charge of the palace, and the portrait of the smiling Bourguiba disappeared. Then, in early 2011, Ben Ali was ousted by protesters and took up exile in Saudi Arabia. The new occupants of the palace discovered the old portrait of Bourguiba and hung it up in the entrance hall. The smiling face greeted us as we walked in to interview Moncef Marzouki, the new president. Marzouki seemed out of place when he arrived to sit in his predecessor's spectacularly overstuffed chair. Rather than being a strongman, he's a soft-spoken doctor and human-rights activist who was jailed for several months by Ben Ali back in 1994. And the palace no longer seems to fit the job description of its current occupation. The president of Tunisia no longer calls every shot. Marzouki was chosen by the elected members of a new constitutional assembly. And his current term, which began last December, is only supposed to last a year while the assembly writes a new constitution. Yet he calls it a "dangerous year" because expectations are running high and jobs are scarce following the revolution. When we visited, Marzouki was wrestling with the assembly. We asked him how he was adjusting to his new job, whose parameters are still being defined. "When you have been under dictatorship for over five decades your main problem is to prevent a new dictatorship," he said. "So now we are discussing about how to share power between the prime minister and the president so that no one can become dictator." One example of this balancing act concerns the former prime minister of neighboring Libya, who fled to Tunisia as Moammar Gadhafi's regime was crumbling. Tunisia's justice minister said the former Libyan official would be returned home for trial. But Marzouki said he would block the extradition. "They came to me and said, 'Mr. President, it's the national interest of Tunisia to return this man back to Libya.' And my response is that Tunisia has interests, but also has honor," Marzouki said. "You want to make sure he gets a fair trial when he goes back to Libya — if he goes at all." The Tunisian president said his position was informed by his earlier work. 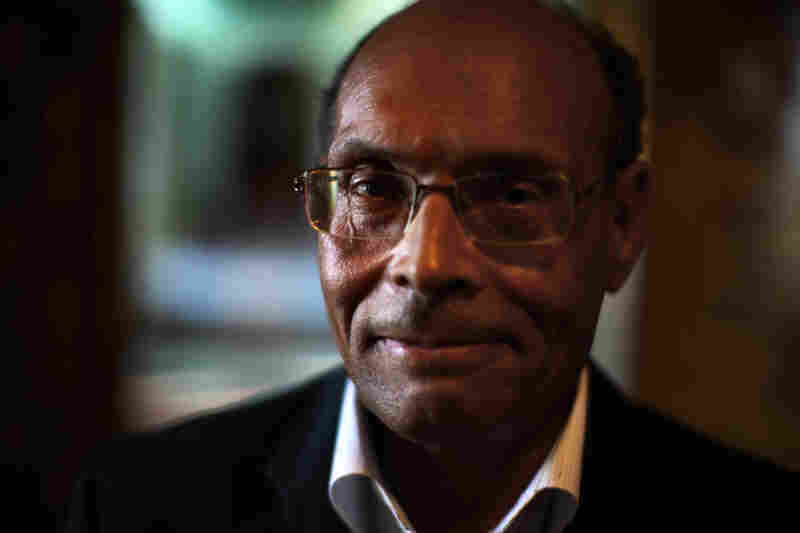 "Before being president of Tunisia, I was a human-rights activist and I will never return a man that I'm quite sure that he could be subjected to torture, or the death penalty, and so forth, so I'm not going to return him," Marzouki said. We asked if there would have ever been such a discussion under in Tunisia under Ben Ali. "Of course not, and you know it," he said. We also asked the president about the economy, which has been struggling since the revolution and suffers from an unemployment rate of about 18 percent. "It's our main problem. It's a huge challenge. And we do know that if we cannot succeed in tackling this issue — giving jobs to people — then we can have a revolution within the revolution," he said. "This is why we're working hard to attract investment. Because it's really a matter of death or life for democracy in Tunisia." As a Mediterranean nation, Tunisia has been outward-looking and open to other countries, including those in Europe, whose tourists have long flocked to Tunisia's sunny beaches. But the revolution has hurt tourism and other industries, and the president called on the West to assist Tunisia and its troubled economy. "We badly need the help of our friends in Europe, in the United States, because Tunisia is now a kind of lab — the whole Arab world is watching," he said. "This year, which is the most dangerous year because it's the year after the revolution, and the level of expectation is very, very high. And people are waiting for everything — for a miracle." The new government, he said, faced great pressure to deliver. "People are really expecting a rapid and massive solution to the problems," he said. "But what we are trying to do is to tell them that now for the first time they are free. For the first time they have no corrupt government. For the first time they have men and women working hard to resolve their problem and they don't have any other solution, [any] other choice, than to wait for the result of this policy."